This one is for Smiley! 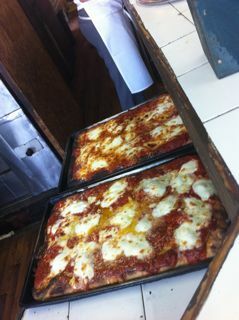 On my recent trip to New York City I had one food quest at the top of the list... get some NY style pizza. No disrespect to my Chicago roots with deep dish but I'm hands down a thin crust floppy sloppy New York Za kinda guy. A lot of people were telling me to head to Brooklyn, soime said Grimaldi's others touted Di Fara. What's a guy to do but just check them both out! Since Hawaii is nearly devoid of this style of pizza, all I was really craving for was your average street side pizza by the slice joint to satisfy my pedestrian taste. So on the way back from a shopping excursion from Chelsea Market, I chanced by a no-named joint called Stella's, no frills pizza by the slice that perfectly filled the spot. I loved it! But I had to see what all the hooplah was about Brooklyn za. So I started with Grimaldi's which was down the street from my brother-in-laws art studio in the shadow of the Brooklyn Bridge. Good ingredients, charred crust but a little undercooked in the middle. Sum it up... it was just good. Now a little deeper into Brooklyn to Di Fara Pizza, 3 Metro's, about 20 minutes out of Wall Street. Got there late at 11:50am thinking they opened at 11:30 but wrong they open at 12 or when they want or depending on how Dominic feels that day, hey, give him respect he's 74. So standing in line, 3 peps in front of me, the wait begins! 12:06 doors still not opened. Dom is looking good! He is the only one touching the pizzas, like a surgeon, all the ingredients are passed to him for his placement. Had the try the "squares" too so 12:39 they come out, like a cross between NY n Chicago deep, richer meat based sauce, damn good! My Winner hands down! Worth the trip? Given the modest travel, relatively short wait and the squares... definitely yes. OUT OF FOIE BUT WE GOT THE GREEK!